RTL-820T Dongle from NooElec. One of the good ones! 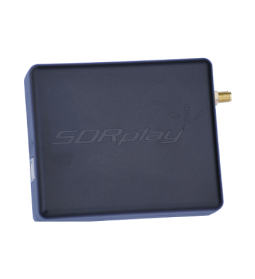 The recently reviewed SDRPlay is the perfect step up from the RTL-Dongles. Matter of fact if you decide to skip the dongle phase you may want to go straight to this one. With very wide coverage from 0.1MHz to 2GHz you can listen to just about anything. The very wide bandwidth up to 8MHz will you to view large swaths of frequencies at once in the SDR software client or even set up multiple VFO’s to monitor several frequencies at once. Easy to set up with free SDR software such as HDSDR, SDR-Console, and CubicSDR. 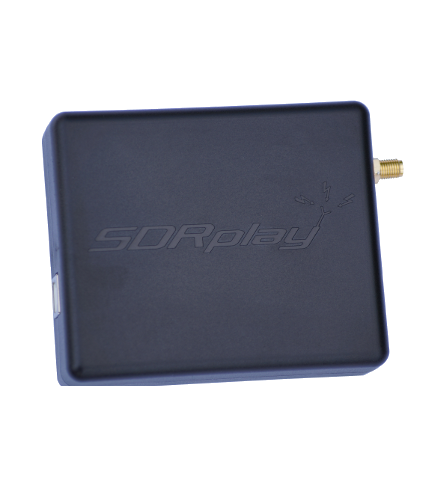 Great support from the SDRPlay team is included. This one is a winner. 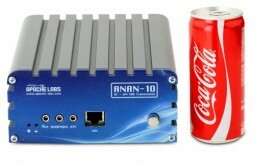 The 14 bit Anan 10E offers a lot of features for the money. HRS reviewed this product a few months back. The feature set was pretty impressive at this price range. HF and 6M coverage, dual slice receivers, 15-20 Watts out, 3 antenna outputs, and excellent receiver and transmit quality. Thats just getting started. 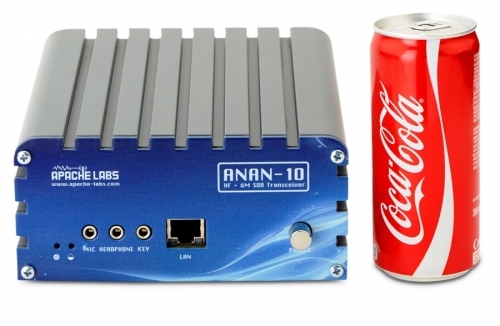 The Anan 10E is mainly powered by an open source version of Power SDR. Nearly everything is tweakable. It’s bandwidth isn’t the highest around at 384kHz, but the dual receivers help to make up for it. The diminutive 16Bit FDM-Duo is a little powerhouse. The FDM-Duo can be used as a completely standalone HF – 6M transceiver with 5 watts output. When connected to a computer and Elad’s FDM-S2 SDR software it becomes an SDR powerhouse. With it’s 6 MHz sampling rate the FDM-Duo becomes extremely flexible offering up to 9 simultaneous receivers ( 1 on center frequency stand alone, 4 FDM-SW2 in fist 192kHz channel and 4 in the second 192kHz channel). You can also have two independent. Much like the Anan you can have two independent 384 kHz receivers. The FDM-S2 also offers a wide variety of features and flexibility in audio routing. The FDM-Duo is a bit like the Flex 6000 series in that most of the processing is done in the box and the computer mainly acts as a client to add additional features and processing. HRS has a FDM-Duo under review right now, so keep checking back. The Icom IC-7300 is the first low cost all in one direct sampling 100 Watt HF SDR transceiver available for an affordable price. If forced to chose one it would have to be between the IC-7300 and Elad-FDM Duo. These are both excellent HF SDR transceivers, but the IC-7300 is a better standalone SDR receiver. However, the Elad FDM-DUO is a better traditional software driven SDR since the IC-7300 doesn’t currently offer this feature. So, it’s a tie between IC-7300 and FDM-DUO. Next: Next post: Elad FDM-DUO – SDR Done Right! What about Airspy or RFSpace, or Afedri and others? ….. and don’t forget the Persius which has long been considered a great performer for the Shortwaves with its excellent filters. After four years am still using one of those “dirt cheap” RTL-SDR dongles and a Nooelec upconverter and am very satisfied. Best bang for the buck. Very nice summary of SDR receivers, thanks! A wide coverage SDR that has been flying under the radar for quite some time is the NetSDR. I bought one from RFSpace and they included the VHF/UHF downconverter for me long before they released the NetSDR+ which comes with said converter. This receiver is an exceptional “DC to Daylight” option but definitely a lot more pricey. I also have an Airspy and SDRPlay, both great SDR’s in their own right. yesterday icom release the new Official Info for the EU Market. it looks like the spectrum waterfall can be observed with the RS-BA1 software. Im sorry but this article is like a roundup of 2 apples, 3 oranges with the result that the author likes tomatos best. Randomly picking some wideband gear, missing out on the really wideband gear and declaring something HF the winner in the category “I have no idea what I’m doing here”. I’ve tested the fdm-duo, and the side of my flex-1500, leaves much to be desired, the duo has a intermodulation very strong, which will only be removed with the selector switch of the same brand, the flex does not have one, hopefully dui remedy this anomaly. It’s hard to properly review, let alone state “BEST OF”, if you haven’t even touched the rigs. In all fairness, that would take a lot of $$$ or generous loaners. Article is fine, but the lack of thoroughness doesn’t meet the bold title. Lots of great contenders not invited to the match. Best SDR radio so far is LimeSDR USB3.0. How can the LimeSDR be “best” when it’s still vaporware? Vapourware no more, a number of review unit are out there already a performing very well. I still can’t buy one, not that I’m necessarily in the market. Many SDR radios are reviewed by real users on eHam. We seem to be forgetting about the Genesis line of SDR’s????? So I read that to mean that this is NOT meant to be an exhaustive review of all things SDR, but rather a roundup of certain units favored by HRS. It does also say that some were reviewed by Ham Radio Science and some were not. Please people, read and pay more attention. As a long-term ICOM owner, I am really looking forward to the release of the new IC-R8600. ICOM say they have no firm details so far about timescale and pricing, but the pre-release leaflet looks good! It is now on the ‘wish-list’ – As long as it is not too pricey (like the IC-R9500)! I am very Happy with SDRPlay.I am a HF / Sw listener.It almost compares to my Drake R8B.Sound quality with SDR console is great.Able to copy weak signals good.FM stereo is excellent with SDR console. Looking for a good SDR transceiver for HF coverage 1.5–>30.0 MHz. Would be used for standard HF 3kHz channel use and have processing power for wideband HF use, also. My area of interest is HF (0 to 30 Mhz). I have the SDR Play 2,intende SDRUNO software. HF performance is well below that of an ICOM ICR75 or KENWOOD R5000. The software is good but complicated, digital bandwidth filters are good. Without an external attenuator, my Wellbrook Loop heavily overloads the SDRplay2. There is a lot of experimentation with the two gain controls when using SDRUNO software, it would be quite easy to give up before getting useable results when setting up the software. The SDRUNO software is good but a lot to learn all at once – did I say complicated? ( I still have not got to grips with the memories). There are instructions and an SDRUNO COOKBOOK but these do not answer all questions. I have a tv dongle and nooelec down converter this works fairly well for HF considering the cost , the SDRPLAY2 is a little better than the dongle on HF but not dramatically better. I bought an RSP2Pro last week. I had been thinking about it for some time but a recent spate of power line noise got me thinking this might be a decent search tool, covering frequencies higher than my SDR-IQ tunes. Boy was I mistaken. This thing is pathetic and the software is simply awful. I tuned WWV on 10 MHz using a tuned dipole and had overload from an AM station on 830 KHz despite using the so called MF notch filter. It took at least 20 dB attenuation to kill it. I’m hoping HRO will take it back without a restocking fee. Hi Wes i’m agree with you. I’ve bought Rsp2Pro 3 week ago and i have same issue MW with Italian Radio Broadcasting that transmit 40Km far from me. I opened a ticket with Sdrplay and they advise me to buy this filter :Distill:AM Barebones – Broadcast AM Bandstop .